Has the bank rejected or returned mortgage payment? Did you enter into a forbearance agreement and now the bank is refusing to honor it? Were you foreclosed on while in forbearance or a repayment agreement? Have you received notices of issues with your escrow account? Are you making your monthly payments and still receiving default notices? Has your monthly payment amount changed without explanation? Has a lawsuit or foreclosure been filed against you on your Home Equity Loan? Do you believe you have been the victim of misconduct under the Deceptive Trade Practices Act (DTPA)? For most people, the home they live in is the most important investment they will ever make. That’s why a foreclosure on their home can be an extremely challenging experience to endure. Not only can a foreclosure cause lasting damage to an individual’s financial standing, but it can also deprive them and their families of the place they have called home for years. Sadly, there are far too many situations in which lenders wrongfully foreclose on a home. 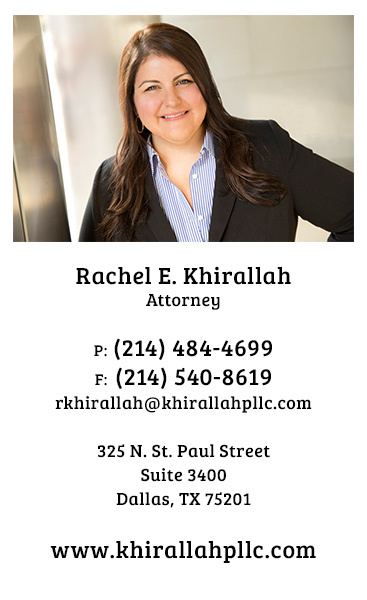 If you have been the victim of wrongful foreclosure, Ms. Khirallah knows how difficult it can be to face this situation on your own, and she works zealously on behalf of homeowners to see that lenders are not allowed to take advantage of them. She regularly represents borrowers in litigation arising from mortgage foreclosures, or the threat of a foreclosure, in connection with the origination or servicing of residential and commercial mortgages and home equity lines of credit. Because proving wrongful foreclosure is complex, the task is best undertaken by an experienced attorney who knows the applicable lending laws and has the resources to fully investigate documents relating to your loan. It’s also important to have an attorney with the experience to deal with big banks and other lenders. Ms. Khirallah fights for homeowners facing the unjust or unlawful foreclosure of their homes through no fault of their own. Using her years of experience, she works diligently and aggressively to hold lenders responsible when their negligence or fraud seriously harms individuals and families. • Servis One, Inc. dba BSI Financial Services, Inc.
• Ocwen Financial Services, Inc.
• Wells Fargo Bank, N.A. • PNC Financial Services Group, Inc.
• FCI Lender Services, Inc.
• American Home Mortgage Servicing, Inc.
Khirallah PLLC is uniquely qualified to manage these disputes in the best interest of homeowners. Not all mortgages are the same and not every borrower hopes for the same result. Ms. Khirallah collaboratively works with her clients to determine an outcome that would be in their best interest and executes a creative and unique plan to achieve such an outcome.